Please select your preferred atomizer ohm type from the dropdown menu. 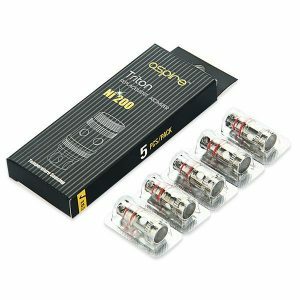 The standard kanthal atomizer heads can handle up to 30-35W (0.5ohm) and 30-45W (0.3ohm) when used on a variable wattage device. The nickel and titanium atomizer heads can handle up to 60W (0.5 Ti and 0.15 Ni) and up to 30-80W (0.3ohm) when using a temperature control device and depending on your device and settings, can create large amounts of vapour and flavour. 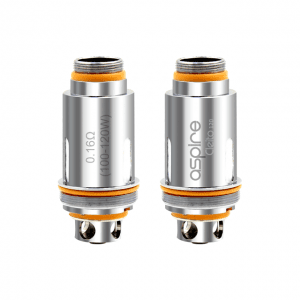 Dual coil build, can handle a power output between 30-80W depending on your atomizer head. Available resistance of 0.3ohm, 0.5ohm, ECL 0.18, 0.5ohm Ti and 0.15 Ni in a pack of 5. Natural cotton wick providing clean flavour. 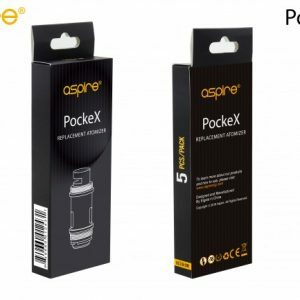 This 5 pack of Aspire PockeX replaceable atomizer coils is compatible with Aspire’s pen style, AIO e cigarette device. PockeX coils have a unique design which delivers the fuller flavour of a sub-Ohm vape, combined with a mouth to lung, cigarette style draw. 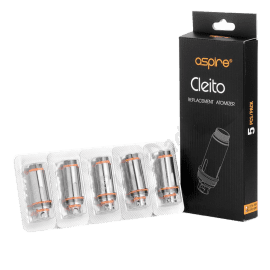 Designed specifically for the Aspire Cleito 120 tank, these coils are rated at 120 watts but can easily handle 160 watts and higher – perfect for cloud chasers who enjoy maximum clouds and maximum flavour.